Last week we ended on a high note—a really high note! We read about how the Father displayed His all-surpassing strength when He raised Jesus from the dead and exalted Him far above every other ruling power, both seen and unseen. We also discovered that Jesus isn’t the only one who benefits from this lofty position at the Father’s right hand: the Son of God has been appointed head over all things for the church, which is “His body” and the very presence of God in the world (i.e. His “fullness,” see 1:23). Therefore, the God who created all things makes this “resurrection/exaltation” power available now, at the present time, for every one of His adopted children who were chosen before the world’s foundation. Amazingly, God had planned their redemption before He spoke the universe into existence and said “Let there be light!” (Eph. 1:3-6; cf. Gen. 1:3). Here in 2:1-10 we’ll get an in-depth look at an integral part of God’s plan to reconcile and consummate all things through Christ (cf. 1:10): We’ll see God turn sinners into saints in order that they might live out a purposeful life complete with tailor-made assignments prepared beforehand by the Father himself. And then, in next week’s section (2:11-22), Paul will cover the corporate aspect of our salvation [Jews + Gentiles united] and the function of Christ’s body as God’s temple on earth. Paul begins with the bad news: the world is dark, and it appears hopelessly lost. 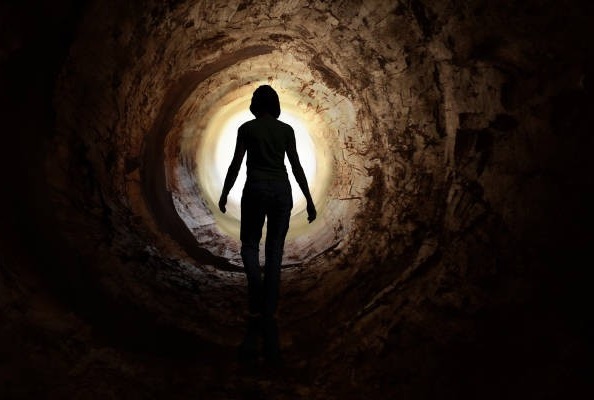 There are casualties everywhere in this ongoing spiritual war, and we shouldn’t be fooled even if we are able to take a breath, think, talk, or travel the world—these activities don’t qualify as being “alive” in any spiritual sense of the term. On the contrary, this world is full of the walking dead, and they don’t even know they’re dead. *Wiersbe, "Ephesians," in The Bible Exposition Commentary, vol. 2, 17-18. *The apostle John confirms what Paul says in this letter, "...the whole world lies in the power of the evil one" (1 John 5:19, ESV). See also Luke 4:5-7; Revelation 13:1-3, etc. **Jesus prays for his disciples, who later become the apostles, "...protect them from the evil one. They are not of the world, as I am not of the world" (John 17:15-16, HCSB). *Grammatically speaking, the Father [subject] is the one who is doing all of the action [verbs], "Finally, in 2:4-6 we come to the three main verbs of the single sentence that comprises 2:1-7, describing three divine operations..." (Kuruvilla, 58). The NKJV renders these three main verbs: "made us alive together," "raised us up together," and "made us sit together." Out of the vast riches of His mercy and grace, and because He loves us so much, the Father grants His children the same position and privilege as His Beloved Son, Jesus. * Wiersbe highlights the subtle distinction between grace and mercy in this way, “In His mercy, He does not give us what we do deserve; and in His grace He gives us what we do not deserve" (Wiersbe, 19). *Refer back to Eph. 1:20, where the Father raised Jesus from the dead and seated Him far above every other power. The same is said of believers in 2:5-6. "What a shared destiny—what is true of Christ, is now also true of believers! Indeed, it is only because of their identification in Christ that believers in him are enlivened, raised, and seated with him" (Kuruvilla, 59). And so, if anyone is going to join the Father in His mission to reconcile and consummate all things through His Son, Jesus, then he or she must first be brought to life from spiritual death. For emphasis, Paul reiterates in 2:5 what he already stated in 2:1, except this time with an all-inclusive first-person plural, “even when we were dead in trespasses.” Dead people don’t make any moves toward God; therefore, God must make the first move to bring them to life. There is an already-but-not-yet aspect to the Father’s co-enlivening, co-raising, and co-seating of believers. Theologians call the present reality of a believer’s exalted status in Christ “positional sanctification” as opposed to full, or final sanctification. However, the Scriptures affirm elsewhere that the entire body of Christ will one day literally and physically rise from the dead, receive incorruptible/glorified bodies, and be taken up to heaven. *Compare with Revelation 5:6, where Jesus (the Head) is pictured with the Church (His body) in glory, "And I looked and behold, in the midst of the throne and of the four living creatures, and in the midst of the elders, stood a Lamb as though it had been slain..." (NKJV). Paul, writing around three decades before John (circa AD 60), depicts the Church as already raised up and seated with Christ in heaven, although at the present time, we do not see the physical fulfillment of this spiritual reality. Nevertheless, God means what He says, and the book of Revelation confirms that the fullness of Ephesians 2:6 and the complete sanctification/glorification of the body of Christ will come to pass! 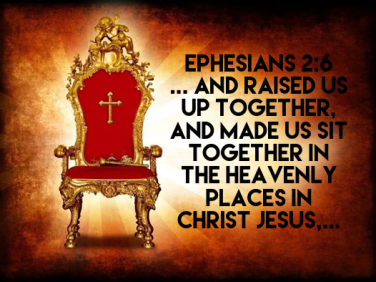 For a more in-depth look on this subject, please see my third installment of the Church of the Firstborn series, "Raised Up, Seated with Christ, and Ready to Rule." In other words, the members of Christ’s body are trophies of God’s grace and kindness. We will be on display* for all to see in the ages to come as a testimony and witness to the Father’s true character. He is going to finally and eternally put to rest the lie of the enemy that says God isn’t loving, gracious, good, merciful, or just. Therefore, if you are a member of the body of Christ, then consider yourself blessed—you have been saved by grace! *The Greek verb translated "He might show" is a compound word, en + deigma, found in early Greek literature (e.g. Plato, Euripedes, Plutarch, etc. ), and often used in a legal context; other definitions include: to exhibit, prove or make clear by evidence or reasoning (A Greek-English Lexicon of the New Testament, 3rd ed., 214-15; Liddell-Scott, An Intermediate Greek Lexicon, 259). Paul repeats and further explains what he said in 2:5 (“by grace you have been saved”) in order to drive the point home: those who are saved by God’s grace have no grounds for boasting or any reason to pat themselves on the back once they get to heaven. The complete work of salvation from beginning to end is God’s gift, and this gift is received by means of a person’s faith in Christ Jesus (refer back to Eph. 1:13, “when you heard the word of truth, the gospel of your salvation, and believed in him”). Much debate has centered around the demonstrative pronoun ‘this’ (touto). * Though some think it refers back to ‘grace’ and others to ‘faith,’ neither of these suggestions is really valid because the demonstrative pronoun is neuter whereas ‘grace’ and ‘faith’ are feminine...the neuter touto, as is common, refers to the preceding phrase or clause. (In Eph. 1:15 and 3:1 touto, ‘this,’ refers back to the preceding section.) Thus it refers back to the concept of salvation (2:4-8a), whose basis is grace and means is faith" (Hoehner, "Ephesians," in The Bible Knowledge Commentary, vol. 2, 624). *The NKJV translates the Greek pronoun touto as "that" in 2:8, "...and that [touto] not of yourselves; it is the gift of God." “Salvation is from the LORD!” the prophet Jonah exclaimed (Jnh. 2:9; cf. Ps. 3:8; Rev. 7:10), and the name of Jesus means “The LORD [Yahweh] saves” (Matt. 1:21; Acts 4:12). And here in Ephesians, the apostle Paul is in agreement with the rest of Scripture. Salvation is God’s gift, and Jesus, the Savior, is the Father’s gift to the world (John 3:16; cf. Isaiah 9:6). *"...though salvation is not 'of works' (2:9), the outcome is for works (2:10). Works are not the ground of salvation, but the goal thereof—salvation's fruit, not its root" (Kuruvilla, 63). Paul says that believers are God’s “workmanship,” which in the Greek is the word poiema, a term recognizable in the English language as “poem.” Thus, being “created in Christ Jesus,” implies that God has introduced something new inside the believer (cf. 2 Cor. 5:17); furthermore, the aim of this new creation, “in Christ Jesus,” is a productive and eternally meaningful life that will bud, bloom, and blossom into a beautiful masterpiece—all to the glory and praise of the master Creator, Engineer, and Artist. *Paul has already provided a list of things that God has prepared beforehand for the believer [all Greek words have the prefix, "pro," meaning "before"]; for example, we were chosen/elected before the foundation of the world (Eph. 1:4); predestined to be His adopted children (Eph. 1:5); made aware of His good will and purpose (Eph. 1:9); and predestined to be His inheritance (Eph. 1:11). Despite all of the disagreement and confusion surrounding faith and works throughout Church history, Scripture affirms both that God saves us by His grace alone (Ephesians 2:4-9; Romans 3:24; 11:6; Galatians 2:21; 5:4; Titus 3:7) and that He graciously empowers us to accomplish good works which were planned and worked out by the Father before we were born (1 Corinthians 15:10; 2 Corinthians 9:8; Philippians 2:13; 2 Thessalonians 2:16-17; Hebrews 13:20-21; James 1:17-18). “Believers, sharing Christ’s exaltation, demonstrate to the universe God’s mercy, love, grace, and kindness as they undertake good works" (Kuruvilla, 64). Every believer needs to allow for Paul’s words in 2:1-3 to sink in—it should be a knockout punch to any pride or boasting in one’s own deeds or accomplishments. Furthermore, we all need to understand the gravity and severity of our situation before we heard and responded favorably to the gospel, the good news about Jesus Christ. A healthy dose of reality (a hard pill to swallow, for sure), should help us to stay alert in our own walk with Christ and be sensitive to others who are still labeled as “children of disobedience,” those who are under the influence of their own sin nature, the evil one, and the wrath of God. Also, Ephesians 2:1-10 will help to sharpen our understanding and clear up any confusion about our message to the world. As believers, we need to live lives that are marked by grace, not fear, legalism, or self-righteousness. We will not attract non-believers or gain a hearing of the gospel if we are communicating, in word or deed, that God is harsh, exacting, ready-to-punish, distant, unrelatable, unpredictable, etc. On the contrary, as we have seen from this current study, God’s grace takes center stage and should influence everything about us. When it comes to our salvation, It is grace from start to finish—even in our good works. So then, let your light shine before men (Matt. 5:16), but don’t let yourself or your neighbor down by failing to live in light of God’s grace. I bought a small stone cross that has that verse on it (2 Cor. 5:7) at a low point in my life (it was roughly 12 years ago). Unbeknownst to me until days ago was the context of 2 Cor. 5:1-10, which is longing for the rapture. Another great study brother. While there are dozens and dozens of passages upholding justification by faith, Ephesians 2:8-9 has become a rallying cry in the Church because it so succinctly defines the truth. Yes, I love those places in Scripture where you find a distillation of several passages into one or two verses. 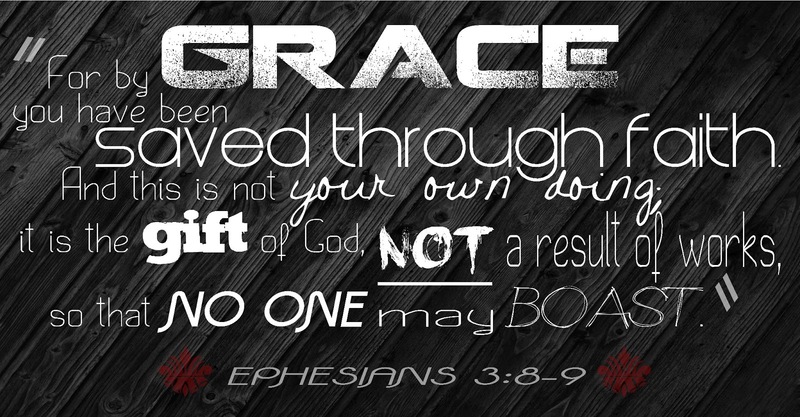 Ephesians 2:8-9 should be a given for believers to internalize, especially those new to the faith. Document of Human Fraternity: A document made by Pope Francis - ZERO Mention of JESUS CHRIST. But 16 times for word GOD....sounds good. But read and understand the context... it is having GOD with the same GOD as the Muslim. https://www.youtube.com/watch?v=wo6tnuFfUTE Watch - historic visit. One World Religion in quick and unfolding right before our eyes. Thanks for posting, Ryan. You're right. The pieces just keep falling into place. Thank you, Ozark. I'm appreciating this study too. Glad you are along for the journey. In my country I saw Orthodox priests preaching in evangelical churches and evangelical pastors who preach in Orthodox churches. In our parliament united the Orthodox with the evangelical. Including Orthodox prayer breakfast with the Patriarch and all cults including Evangelical.. Sad to see so many fulfilling 2 Tim. 4:3-4. But! You are evidence that there is always a remnant who still have an appetite for the truth! Great joy is coming!,...also wanted to say Thanks to Greg for the awesome links in connection w/ Migdal Eder Tower and pod casts at Planobible Chapel site on Daniel 8 etc. Them Jacob Sheep are Amazing and more,...very enriching to take this in! Having my coffee this morning and reading through all three weeks of Ephesians studies - thank you so much for blessing us with His encouraging Words. Hey, BC! Glad you are going through this study with me. I'm encouraged too!